It’s finally happening! The movie sequel for TVB’s A Step into the Past <尋秦記> is ready for production, and the OG members are all coming back. TVB’s A Step into the Past, aired in 2001, was adapted from the wuxia novel The Chronicles of Finding Qin by Hong Kong author Huang Yi (黃易). It starred Louis Koo (古天樂) as the main protagonist Hong Siu-lung, a 21st century police officer who traveled back 2,000 years with the mission of witnessing the ascension of Qin Shi Huang (Raymond Lam 林峯) as the first emperor of a unified China. However, a software glitch in the time machine took Hong Siu-lung back a few years before the ascension, and he must race through time to return to the future. 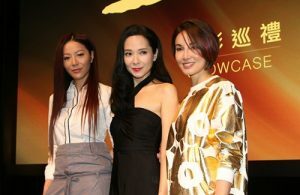 A Step into the Past paved the careers of Raymond Lam, who was still a rookie actor at the time, and Sonija Kwok (郭羨妮), who had just completed her pageant run. A Step into the Past also gave Louis his first and only TV King win. 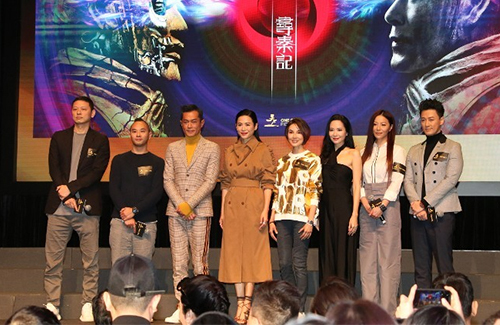 At the Entertainment Expo held today, One Cool Film Production announced that the original cast members of A Step into the Back will return for its film sequel, including Louis Koo, Raymond Lam, Sonija Kwok, Jessica Hsuan (宣萱), Joyce Tang (滕麗名), and Michelle Saram (雪兒), who returned to acting in 2017 after a decade-long retirement. omg yes!! at least they have a lot of the original casts!!! Probably not as good as the series but cant wait. i miss kong wah why didnt louis cast him back in this movie version. he is one of the main villain in the drama version. @kolo It’ll be hard to get him back out. He joked in an interview he met fat gor and told him he’ll come back to acting if fat gor has a project for him. @mike i know kong wah will not easily make a come back but if he get a chance to act beside fat gor and there is a good script with a significant role to play then i think he will. still it is a great miss if he isnt in a step into the past movie version. i think he will outshine louis and raymond if he is in. Definitely. Kong Wah is the best actor among the three (Louis Koo, Raymond Lam and Kong Wah). Joyce Tang was my favourite female character in the TV series! SO glad they casted her! I saw the video for this conference and Michelle looks like she had so much botox. I hope this won’t impact how she emotes in the film. Also, I appreciate they’re not reprising old storyline since it wouldn’t make sense to see a 50 year old Louis Koo play a 20-something one. I think this means we’re going to see his son in the sequel and their subsequent fight to overthrow Qin Dynasty? And Kwong Wah died in the first drama, which is why he won’t be in the sequel…although Michelle died in the first series too, not sure why they’re putting her in here again. Maybe as a memory or some look-alike? @kuks I remember skipping all her parts in the drama because she was just painful to watch. Am I the only one not excited? I think sometimes classics should be left untouched. Forcing sequels usually end up tarnishing the series. @megamiaow Yes, I am re-watching it right now. I remember how much fun it was the first time, but also all my annoyances with it. Sonija and Michelle were beautiful but weak actresses. I wish he just chose one woman (Jessica or Joyce) instead of this “let’s make everyone happy” thing. He is a smart guy from the future, but he isn’t Einstein so his knowledge about everything was incredulous. A sequel will just ruin the charm of the first. @potatochip Joyce’s character was the best female character is the series but I didn’t want her with Siu Lung back then because (1) she deserved someone who would love hear wholeheartedly (2) I was biased for LJ. OMG! So happy to see LF reuniting with the rest of the crew! Looking forward to all his new projects.